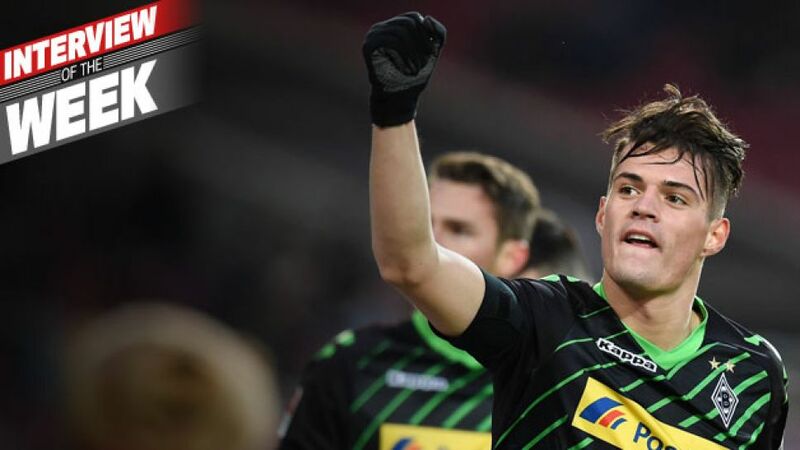 Mönchengladbach - One of Borussia Mönchengladbach's mainstays this season, Swiss midfield string puller has been central to the five-time champions' rise to third in the 2014/15 standings. Speaking in bundesliga.com's Interview of the Week ahead of Gladbach's clash away to fellow UEFA Champions League hopefuls FC Schalke 04, the 22-year-old waxed lyrical about the Foals' current form, head coach Lucien Favre and his partnership with , as well as explaining why he committed his long-term future to the club. bundesliga.com: Granit Xhaka, two wins from two games - Borussia Mönchengladbach could hardly have enjoyed a better restart to the season! Granit Xhaka: Agreed, and we were hoping to achieve just that. We started poorly into the second half of the season the previous two years, which is why we were particularly keen to do better this time round. Two 1-0 wins, six points after two games - we really couldn’t have hoped for more. bundesliga.com: Just what makes Gladbach so strong at the moment? Xhaka: I think it’s obvious that the team has matured. We weren’t quite at our best against Freiburg, but we’ve had better performances in the past and may have still only taken a point or even lost. Freiburg were the better side, but we still won, which shows we’re a lot wiser. bundesliga.com: The tight results also suggest that Borussia are taking a more defensive approach than in the past. Xhaka: We conceded the second-fewest gaols in the first half of the season, we’re really strong in that department. We need to be more clinical up front though. Against Freiburg we should’ve decided the game in the first 25 minutes when we missed three or four clear-cut chances. Our conversion rate wasn’t good enough in the first half of the season either. Then again we won’t complain if we manage to win the remaining games this season 1-0.
bundesliga.com: What can Gladbach achieve this season? Xhaka: I believe the players, and the club likewise, hope to do great things. But there’s still a long way to go this season, we have to work hard every weekend and give it our all. There are no easy games. bundesliga.com: What are those great things you’re talking about? Do you hope to qualify for the Champions League? Xhaka: Of course, everyone dreams of playing in the Champions League! If you didn’t have that ambition, you should stop playing really. We’re on the right track to realising our dream, and hopefully it will come true at the end of the campaign. bundesliga.com: Who will be your main competitors? Xhaka: Wolfsburg are certainly in good form, same goes for Leverkusen and Schalke. And don’t forget Augsburg, who have been surprising so many people this season. Those are the four sides we’ll need to watch. Meeting Schalke on Friday will be a real highlight and might show us what we can achieve. Xhaka: They are indeed, but so are we. We beat Schalke when we last met in Gladbach. We’re aware it’ll be difficult to take something from the game. They’re playing a different system under [Roberto] Di Matteo with three at the back, often they have even five players defending. It won’t be easy to beat them in their stadium, but obviously it’s not impossible. bundesliga.com: Did Gladbach’s current run play a key role when agreeing a contract extension last week? Xhaka: No, it wasn’t a spontaneous decision. I’ve settled in nicely here, Mönchengladbach has become a second home. I’m not the type to change clubs after three, four years. This is the right place for me at the moment. I’m happy, which here is what counts. bundesliga.com: Lots of clubs were meant to be after you. Did you take any offers into consideration? Xhaka: There will always be offers as well as rumours, but it didn’t bother me. I told [sporting director] Max Eberl of my intention to stay immediately after he informed me that the club would like to extend the contract. The terms were right, and I’m happy we’ve reached an agreement. bundesliga.com: Both Mönchengladbach’s and your personal development have been very positive lately. The club seems to have improved since you arrived two-and-a-half years ago. Xhaka: This development didn’t only begin when I came here. In the past four years, ever since the coach’s arrival really - and there has been a clear philosophy at this club. Borussia have been playing in Europe almost every year, they’re always near the top. We want to keep this up. Xhaka: (laughing) Yeah, but that’s easier said than done, but in fact it demands a lot of work and lots of extra shifts. The coach knows me well and is aware of the areas which I still need to improve in. I’m only 22, and I know I can still develop, so we’ll keep up our hard work. bundesliga.com: It seems surprising that you’ve only scored two Bundesliga goals despite your strong left foot. Are you practising shots in training? Xhaka: Yeah, of course. Finishing is one of my strengths, but the opponents know about it as well of course which makes things a lot harder. I don’t really care about who scores anyway. Of course I’d be happy to score as many as in the first half of the season, however, when I notched three in all competitions. bundesliga.com: What area are you mainly focussing on in training? Xhaka: I try to improve in every aspect, really. Like I said, I’m only 22 and I can still learn a lot, and I’m sure I will here at Borussia, with this coach. He’s someone who pays attention to detail. We’re on the right track under him. bundesliga.com: Is Favre really as meticulous as it's often reported? Xhaka: The coach is a perfectionist. He notices the small things, which in today’s game can make a big difference. We're happy to have a coach like this. bundesliga.com: Are Gladbach also benefitting from the many summer signings? Xhaka: No doubt, they’ve given our squad more depth and made us stronger. We’re now able to rotate the side without losing any quality, which we need to do having 50 games per year. bundesliga.com: Borussia snapped up quite a few attacking players. Who’s giving you the hardest time in training? Xhaka: You’re always made to work hard in our training sessions, but I enjoy playing against everyone, no matter whether he’s a colleague or an opponent. All new players have quality, they’re all good for different reasons which is why we’re so flexible. bundesliga.com: Who’s been your strongest opponent in the Bundesliga? Xhaka: It’s always difficult playing in the Bundesliga, no matter which club or player you’re up against. I’m not one to name individual players, however. You can only reach your targets as a team. bundesliga.com: Gladbach have two strong characters at the heart of midfield with both you and Christoph Kramer. Who do you consider the boss? Xhaka: In Gladbach the whole team is the boss. I compliment Chris Kramer perfectly actually. We both put in a lot of legwork, win many balls, and we’re comfortable with the ball at our feet. We’re a good partnership, it works out really well. We also talk a lot both off and on the pitch. bundesliga.com: Has the structure within the team not changed at all since Kramer was crowned world champion last summer? Xhaka: No, this wouldn’t be like him. Everyone’s happy for him that he won the trophy, but he keeps his feet on the ground. He doesn’t think he needs to show more now on the pitch. He hasn’t changed. We’re still working everything out together which has served us well so far. bundesliga.com: Will you be taking on more responsibility when Kramer returns to Bayer Leverkusen in the summer? Xhaka: You can’t take responsibility unless you do well on the pitch. It’s a shame Chris Kramer will be leaving. However, the club may well sign new players, and we also have Havard Nordtveit and Mahmoud Dahoud, who’s still very young and will develop further. I’ve got no worries about us finding alternatives.